The home is situated on a double lot (80’x120’ as reported by the Ross Co. Auditor) at the corner of Hildegarten Avenue and Fleet Street with a detached block garage and shed. It offers a lot of updates including mostly all replacement windows, kitchen with tile flooring, 1st floor laundry, full bath with shower over tub, tile flooring, and tiled shower, bedroom with closet, and living room make up the first floor. The upstairs offers a bedroom with closet and bonus room with closet (could be a third bedroom with partition or added wall). 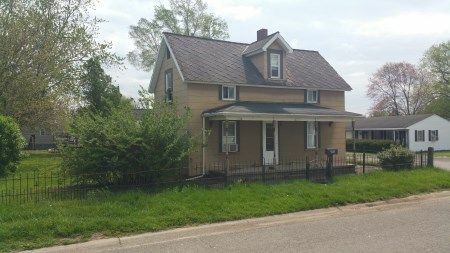 Structure is equipped with City water and sewer, breaker box, electric furnace, central A/C unit, electric hot water tank, and some updated plumbing. 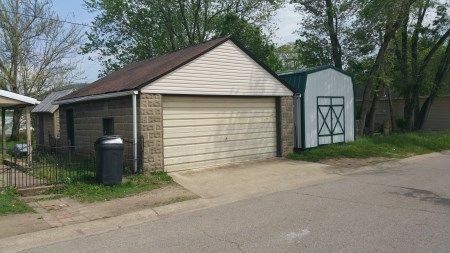 The detached block garage and workshop offers concrete floors and overhead door with opener. There is also a small workshop/storage shed is situated behind garage. 1997 GMC 1500SL Pickup Truck showing 162,905 miles, Red Ext., Automatic, Long bed. SN: 1GTEC14W8VZ539468. 2008 Chevrolet Uplander Mini Van, Showing +/- 131,897 Mi., SN: 1GNDV23188D194758. 2000 Pontiac GRAND AM SE, SN: 1G2NE52T1YM879982. 1987 F150 Ford Pickup Truck, Not Running, SN: 1FTEF14N4HNA19312. Marlin .22 Bolt Action LR Stainless Steel Model Firearm; Sears Pump 12 Gauge Shot Gun Model 200. Firearms will be held offsite until the evening of the auction. Real Estate Terms: $25,125.00 Min. Bid; $5,000 down at time of sale in cash or check; balance & possession upon delivery of deed; offered free & clear prior to closing; taxed prorated to closing date on/before July 23, 2018; sold as-is; no Buyer's contingencies exist; registration required day of sale w/photo ID. Personal Property Terms: Photo ID required; payment in full at time of sale by cash or check; removal day of sale; no loading assistance; sold as-is where-is; no warranties or guarantees offered, given or implied. Taxes & Legal: The Martin J. Barlage Estate, Ross Co. Probate Court Case No. 2018-E-042, Brenda K. French, Administrator, James K. Cutright, Atty. Ross Co. Auditor Parcel No. 's 305648020000 and 305648019000; Net Annual Taxes (Homestead) $296.60. Smith's Subdivision (Hildegarten Addition) PB3 P62.